Nothing makes Portland detective Archie Sheridan happier than knowing that Gretchen Lowell the serial killer whose stunning beauty is belied by the gruesome murders she's committed is locked away in a psych ward. Archie can finally heal from the near-fatal physical and emotional wounds she's inflicted on him and start moving on with his life. To this end, Archie throws himself into the latest case to come across his desk: A cyclist has discovered a corpse in Mount Tabor Park on the eastern side of Portland. The man was gagged, skinned, and found hanging by his wrists from a tree. It's the work of a killer bold and clever enough to torture his victim for hours on a sunny summer morning in a big public park and yet leave no trace. And then Archie gets a message he can't ignore Gretchen claims to have inside knowledge about this grisly murder. Archie finally agrees to visit Gretchen, because he can't risk losing his only lead in the case. At least, that's what he tells himself . . . but the ties between Archie and Gretchen have always been stronger, deeper, and more complex than he's willing to admit, even to himself. What game is she playing this time? And even more frightening, what long-hidden secrets from Gretchen's past have been dredged up that someone would kill to protect? 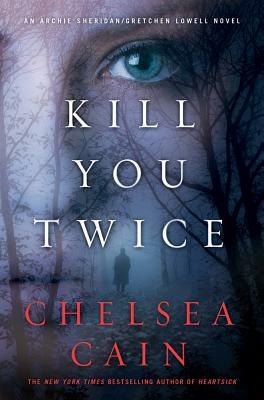 At once terrifying and magnetic, "Beauty Killer" Gretchen Lowell returns with a vengeance in "Kill You Twice, " Chelsea Cain's latest razor-sharp psychological thriller. CHELSEA CAIN'S first four novels featuring Archie Sheridan have all been "New York Times" bestsellers. Also the author of "Confessions of a Teen Sleuth," a parody based on the life of Nancy Drew, and several nonfiction titles, she was born in Iowa, raised in Bellingham, Washington, and now lives in Portland, Oregon. "Utter engrossing. . .Cain [creates] riveting character drama between two damaged souls."